I like it and it already has bloom when I received the plants. Very healthy and packed secured. I just need to make sure not to overwatering it and provide enough light. 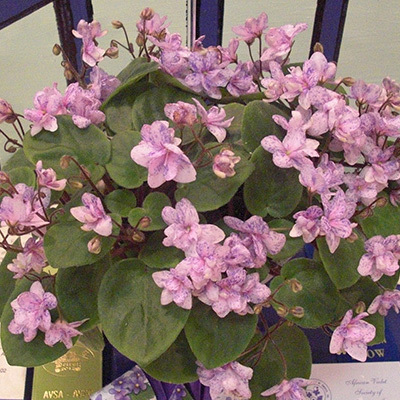 Adorable mini violet is a mound of profuse green leaves and delicate pink flowers. The jewel is in constant bloom under my plant lights! I just repoted again and started another little Bob's Boolaroo in a pot with sandwich bag on top. It now has another leaf! I will soon have two of these adorable African violets in my collection. Fast growing, so many leaves and flowers it's becoming my favorite. I ordered this plant a few years ago and it was one of my favorites! I love the Violet Barn plants so much that I bought them for family as Christmas gifts several years ago and they are still thriving! I ordered this for my mom for Mother's Day last year and got a chance to see it in person in November. She said it arrived with flowers and has never stopped blooming. I didn't realize I was sending her a trailer as her first AV, but she has it in a self-watering container on her coffee table and it is growing beautifully. It is a petite gem of a plant!